This past weekend, Rural Action coordinated the grounds maintenance and recycling efforts at the Nelsonville Arts and Music Festival on the campus of Hocking College. As mentioned in the Athens News on Monday, the recycling program and trash pick-ups were a great success – with organizer Tim Peacock calling the grounds “spotless” following the end of the festival. Rural Action members, volunteers, and staff led continuous litter pick-ups on the festival grounds and camping areas. They also sorted through all of the collected garbage to remove recyclables from the waste. Overall 145 bags of recycling were sorted and removed from the festival grounds. That adds up to over 8,000 gallons of recycling saved from the wastestream! Many festival-goers also stopped by the Rural Action tent to drop off their recyclables and offer their appreciation for our efforts. We'd like to thank the commitment and efforts of the dozens of volunteers who made the program possible. In particular, we would like to recognize the Hocking College Green Club for supplying a bulk of the additional labor. In addition to our work at the festival, Rural Action offers a range of opportunities for members to make a difference through our volunteer program. Contact our Volunteer Coordinator Tori Patterson (tori@ruralaction.org) for more information about the program. 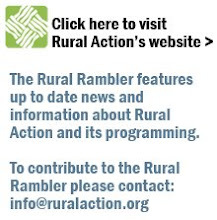 You can also visit the volunteer section of our website (www.ruralaction.org/volunteer). I personally helped out with the trash pick up and it was great. Rural Action was so organized, Caleina, Rose, and Torie were great organizers. I really enjoyed myself!